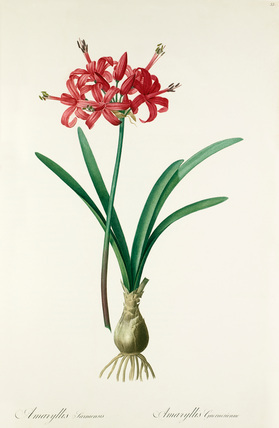 Colour engraved plate from Volume 1 of Pierre-Joseph Redouté's 'Les Liliacées'. This work contains a total of 486 plates depicting plants from the Liliaceae family. Belgian born Redouté achieved success as a painter working for the French royal court tutoring Marie Antionette and later from 1798 was appointed to paint the flowers of Malmaison by Josephine Bonaparte. His famous published works also include Les Roses.